According to this Vatican II document, Buddhism (which in itself is a false religion that does not know God or lead to Him) teaches a way to "Perfect Liberation" and the attainment of "Supreme Illumination" not only "through higher help" (i.e., you receive grace to find God, so to speak) but also by "their own efforts" without a higher help! So according to Vatican II then, man can, by their own effort, reach supreme illumination (i.e., find God) by their self and trough their own efforts and without any higher help (such as in the false religion of Buddhism)! So according to Vatican II, without Grace and Higher Help (God), in whatever religion, one can still find God! This is the religion of freemasonry, i.e, all religions lead to God and salvation. Your analysis is spot on, Jerome! Thank you for commenting. God is not the author of confusion, Satan is. The Vatican II sect and fake Francis spread nothing but confusion. Yoga signs abound at almost all of the Novus Ordo churches around where I live. Now Tai Chi is also being pushed by these so called churches. Just about all of the Novus Ordo churches also let the Masonic cult AA use their church for their meetings. A Novus Ordo school in my area holds their prom in a Boumi Temple. 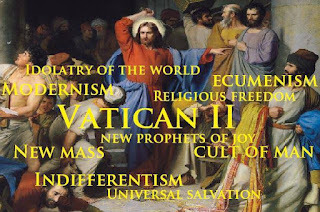 The Vatican II sect has taken the truth of God and turned it into a lie. You cannot mix light with darkness. The Novus Ordo sect is preaching and living another gospel by mixing with other false religions. It is not the gospel of Jesus Christ. You see what most do not by the grace of God. AA is indeed Masonic, and I wrote a post about it, see http://introiboadaltaredei2.blogspot.com/2017/01/addicted-to-masonry.html?m=1. AA, yoga, Tai Chi, anything and everything except the Truth is the trademark of Vatican II. Thank you for the kind words, David! Comments like yours keep me writing. In a conversation with a Novus Ordo priest friend he told a small group of us a story while he was chaplain of a Novus Ordo high school. A parent of a student had passed away so he invited the student's classmates to a service for the the deceased in the school chapel. The problem is, it was a Hindu service. I and another in the group were stunned but the others were sympathetic with "aww how nice." Sympathy for the student and family aside. That is not the issue. The issue is performing a Hindu service in a "Catholic" chapel in a "Catholic " school. The indifference of Novus Ordites is typical in these situations. And you're spot on about yoga as well. Everything is a "feel good" experience which those false religions abound in. "God" is just a buzz word for "I feel good about my inner being" and for many, the image of Jesus is just used to put a face on that feeling. It’s all about “feelings” and beliefs don’t matter. This is the monster of Modernism that is the V2 sect. Where do all of you go for Mass being Traditionalist? I consider myself Traditionalist also but dont know where to go for Mass. I’ll be praying for you! God bless! "Among the religions mentioned in the Council document Nostra Aetate, it is necessary to pay special attention to Buddhism, which from a certain point of view, like Christianity, is a religion of salvation. Nevertheless, it needs to be said right away that the doctrines of salvation in Buddhism and Christianity are opposed." So looks like he regarded Buddhism religion as religion of salvation. Religion that has doctrines of salvation opposite to Christianity but nevertheless salvific. You have correctly expressed the many heresies of John Paul the Great Apostate.